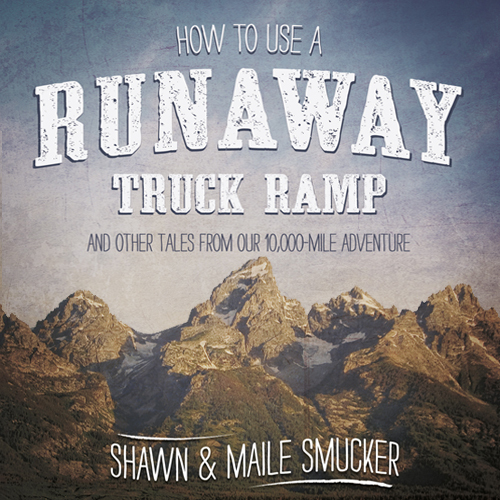 “Like all epic road trips, Shawn & Maile’s story covers as much interior mileage, from one state of mind to another, as their big, blue bus does the physical miles across the United States. This book is many things: a travelogue, a parenting manual, a spiritual narrative. But most of all, it’s an engrossing tale told by two wise and thoughtful writers. Don’t read it if you’re not prepared for the oncoming wanderlust.” – Jason Boyett, author of O Me of Little Faith and Pocket Guide to the Afterlife. You can also order the paperback through Amazon or here at my website (where there’s a special price if you order two copies). A Kindle version is in the works and should be ready by the end of the week. Help spread the word and check back tonight to see if you’ve won! ***UPDATE*** The winners have been chosen. Find out if you won HERE. I’d love to visit Alaska (in the summer). I shared on FB and Twitter. Hoping for a great day for you guys. Thanks again for guest posting today over on The Stretched Blog! Thanks for all of your help with this, Jon. I’ve never been to the New England area. Would love to make it up there one day. Sharing on Twitter now. Thanks for helping to spread the word, Eileen. Maine, without a doubt. Particularly, Acadia National Park. Now that we’ve moved just a little closer (southeastern PA) it might actually happen. I’d love to win, but, even if I don’t, I’m really looking forward to reading the book. I went to Acadia once, many many years ago before I had enough white hairs to truly appreciate it. Thanks for reading, Christie. Shared on Facebook & Twitter. Hope it goes gangbusters, man. I am contractually obligated (meaning I’m married) to inform you that I, er, we would like to visit Hawaii someday. Thanks Chad. And Hawaii is rather incredible. Seattle or bust! I’m definitely going to visit there someday. I have shared on Facebook and Twitter. Good luck, man! My dad and I have made a deal to visit every Major League Baseball park. We’ve visited about 5-6 so far, and I look forward to visiting the rest with him and maybe with a kid in a few years! I’d like to visit the Pacific Northwest as well as hit some of the national parks like Yosemite and the Grand Canyon. Posting link on Twitter. So many good answers already. Would love to have a second honeymoon in Alaska. Take the train ride. Would love to do the two week package with Alaskan cruise and train but I don’t think I can get the hubby on a boat. My husband and I dragged our kids up, down, over, and through many of the national parks in the great Southwest, so I have to think about what I still want to see. I’d gladly travel to anywhere in the country where I could hold down a section of beach. The Pacific Northwest sounds good, too. And for those who have never seen Acadia National Park, it is definitely worth the trip. It drives my husband crazy that there are folks living in New England who have never made the drive, since it is the only National Park in this area. Oh, and tweeted and Facebooked and otherwise shared your launch. All the best to you, Shawn. I would love to see the Grand Canyon. I also shared on facebook and twitter. Congratulations Shawn & Maile! Looking forward to reading & gifting this to friends this season. Have posted on FB (as I have in the days counting down to today actually), though i’m not a tweeter. Hmm, visit where? The mountains in Wyoming i think. Happy Season of Living Incarnation to you and the whole family!! Your writing and your heart are certainly that, ‘incarnational’, for me; doing what the Good News was meant to do: supply relationship and Hope in a broken world where we still love rather poorly. Shawn, I enjoyed following both of your blogs while you were “on the road”and can`t wait to read your book! I wish you every success! Some places I`d love to visit-Bryce,Zion,Yellowstone Parks,Sedona,Colorado…..
Hawaii! It’s the only state I’ve not visited. I would love to visit Oregon and Washington! I would love to visit Yellowstone, and check out Old Faithful! I also posted it on FB and Twitter! Good luck with the new release! I’ve got to visit Hawaii to round out my tour of the 50 nifty United States! I’d also like to see the Pacific Northwest – it looks like an incredibly beautiful place. I shared on facebook & twitter. Of course, my facebook share was not identical to the one listed, so you don’t have to count that one. I can’t wait to read about your adventures!! Of course it counts! Thanks so much, Kim. I would love to live in Colorado someday. I absolutely love mountains and the culture in Colorado is so unique. Plus, there are tons of fun historical sites. I would love to take a trip to Washington. I want to take in the sights of the nature and untouched land. Thank you for the chance to win and I shared on facebook. New England has been on my bucket list for awhile, but Alaska has moved to the top because my daughter lives there in the summers. We are working hard to get there soon. enture grabbed my heart because we were in the middle of a great big brand new adventure ourselves. Maybe their experience gave me courage for mine – however, I just about lost what courage I had gathered when they lost their brakes in the mountains. Way too close!!! I would love to visit Yellowstone National Park and see the Old Faithful. I’d head to Louisville, CO to visit Assorted Goods and friends who’ve moved there recently. I would love to visit Yellowstone national park one day. I shared on twitter. Glad to hear you’ll have a kindle edition! Someday Dan and I hope to visit Alaska. matter where, as I feel that all states have beautiful areas. I’ve been all over the West (north, south, & a little mid) but would really love to take a long roadtrip through the deep South. Preferably NOT in summer! I’d love to read your book! So, I just posted on FB. :-) I’d love to see the mountains in Montana. From the ground, not just flying over them, as I’ve done several times. Actually, I’d like to make a long road trip from IN to OR, and see the sights along the way! Tweeted and Facebooked. I would love to go to… Maine in the Fall. I would love to see the Fall colors. Being here in California, we don’t really see that. Personally, I’d love to visit San Diego at some point (I’m on the east coast). I did share on FB and twitter. So excited to see this out there for the world to read! I love you guys! Thanks for all your support with this launch, Jess. You are awesome. I just tweeted. I can’t wait to read your book. What you do with the English language is absolute art, and I’m sure this will be no exception! Congratulations! Thanks, Aymie. You are very kind. I’d love to visit Louisiana (New Orleans, specifically). Colorado, too – one of our best buds is in Denver and I haven’t been to see him since he moved there. Shared on FB and tweeted (although my Twitter account is private – a pretty small audience…). Always just wanting to get to Maine…and congrats on the new release Shawn! !